U.S. stocks climbed to a new all-time high last Friday, topping its prior record from March 1st by three points, as energy producers rallied and oil prices rebounded after a three-week slide. April non-farm payroll data on Friday was encouraging and helped confirm the Federal Reserve’s view that weak growth earlier this year is transitory. The economy added 211,000 new jobs last month, following a 79,000 downward revised total in March. Also favorable, the headline unemployment rate dropped to 4.4% from 4.5% and the broader jobless rate that includes the underemployed fell to 8.6% from 8.9%. Despite the gains, ETF fund flows showed equity funds had net outflows of $915 million last week vs. $25.2B of net inflows the prior week, while the pace of fixed-income net inflows slowed to $135 million from $3.6B. For the week, the S&P 500 gained 0.66% and is up 7.2% in 2017 and 12% since the November U.S. election. The Dow Industrials rose 0.32%, finishing above 21,000 for the first time since March 3rd; and the MSCI EAFE (developed international) advanced 1.82%. Now that spring is well underway, the old Wall Street calendar adage to “sell in May and go away” is creeping back into investors’ minds. While the saying is catchy, the question becomes whether or not it is actually sound investment advice. Over the last 25 years, during the annual period of October 1 to April 30, the equity market has outperformed the period of May 1 to September 30, where average monthly total returns for the two time periods have been 1.3% and 0.2%, respectively. However, these numbers can be misleading: while returns during the summer months are low relative to the rest of the year, these months still generate a positive return that investors would be missing out on, exacerbated by the lack of compounding. 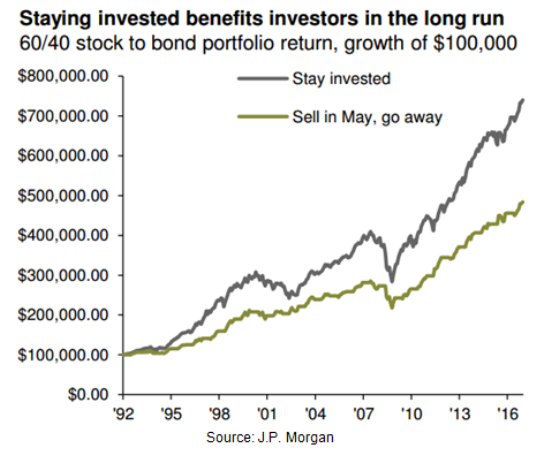 By adding fixed income to the portfolio, the difference between staying invested and selling in May is magnified. Given that fixed income is negatively correlated with equities, it acts as a buffer in turbulent markets and offers a steady stream of income. All of this considered, an investor in a 60/40 stock and bond portfolio using the “sell in May” strategy would have missed out on $255,000 over 25 years compared to an investor who stayed the course. Given this, J.P. Morgan opines that investors should stay disciplined and stay invested, even through turbulent or slow markets in the long run.